Green BioPharma is the emerging practice of seeking to minimize the environmental impact of biopharmaceutical research and manufacturing. Due to the perceived environmentally benign nature of biologic drug manufacturing, biopharma is typically considered "greener" than traditional pharmaceutical manufacture. The reality, however, is that laboratory practices in biopharma research, clinical development, process development, and quality control generate significant amounts of hazardous and non-hazardous waste, and, with biologics manufacturing, consume large amounts of energy and water and contribute to wastewater. To address these impacts, the Green BioPharma program at Genentech expands upon the definition of green chemistry—the design, development, and implementation of chemical products and processes to reduce or eliminate the use and generation of substances hazardous to human health and the environment—to include biological products and processes. The program seeks to implement new technologies and methodologies while encouraging innovative research approaches and process designs to reduce the environmental impact of biopharmaceuticals. An important element of Genentech's Green BioPharma Program is the Green Laboratory Assessment. 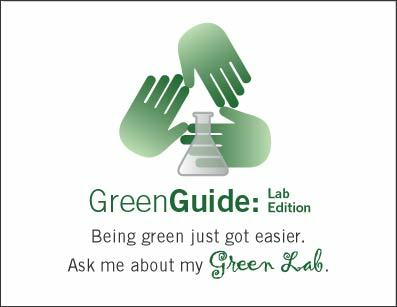 Designed to inform and influence the behavior of individual researchers, the Green Laboratory Assessment is a voluntary activity conducted with the full consent of all laboratory members and manager. The purpose of the laboratory assessment is twofold. The first purpose is to collect baseline data on the environmental footprint of different types of laboratories at Genentech (e.g., medicinal chemistry, molecular biology, DNA sequencing, cell culture, analytical, and bioprocess development) in four categories: energy, cold storage, waste, and procurement. The laboratory's energy footprint catalogs large equipment, such as fume hoods, biosafety cabinets, and ultracentrifuges, as well as benchtop equipment such as microcentrifuges, balances, hot plates, etc. In addition, a power reading is taken for each piece of equipment. The amount, types, and capacity utilization rates of cold storage are cataloged. Waste is assessed in five categories: non-hazardous waste, hazardous waste, biohazardous waste, sharps, and recycling. Under the procurement category, the Laboratory Assessment captures information on how, when, and by whom chemicals, reagents, and supplies are ordered. This information is compiled to form a comprehensive picture of the laboratory's environmental footprint. A summary report is created for the owner of the laboratory that provides an overall snapshot and specific action items to implement to become a green laboratory. The data can be used to set goals and reduction targets. The second purpose is to effect personal, behavioral change. The Green Laboratory Assessment provides a customized list of improvement actions that researchers can undertake. While action items may include one-time changes, such as turning off an unused fume hood or replacing older equipment with equipment that uses less energy or produces less waste, behavioral changes that researchers incorporate into their routine are an important part of this effort. These include sharing chemicals and reagents instead of ordering new, increasing participation in laboratory recycling, better managing one's inventory of cold storage items, and just-in-time stocking. These behavioral changes are supported through several Green BioPharma programs set up across campus, and act as a complement to hardware- and facilities-related approaches to reducing a laboratory's environmental footprint. Importantly, raising researchers' awareness of the environmental impact of their behavior can support environmentally conscious decision-making in other realms such as experimental design, process design, and even product design. This fits well with Genentech's sustainability program and its corporate commitment to improving the lives of patients through innovative science.